Outlook OST to PDF Converter Software – A Wonder Tool! Are you searching best solution for converting several OST emails to PDF documents together? Now in such condition you need to find the best and affordable OST to PDF Emails Conversion Software that will do the work. 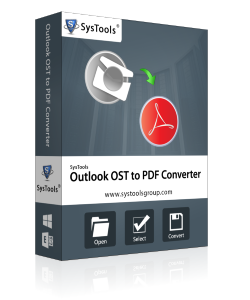 So you can use this reasonable Outlook OST Emails into PDF Converter utility. Outlook OST to PDF Converter Tool is emerging program which will provide outstanding features for those users who want to convert OST emails into PDF together at a time. This target oriented app has become a leader in the field of conversion which always keeps the greatest and revealing conversion results in comparison of other application utility. Using it you can speedily convert OST to PDF with all email properties such as: – To, From, Cc, Subject, Date, Headers, and Footers along with all Email Attachments. Software can convert OST to PDF in bulk without changing in OST email data. Transfer/Move/Convert inaccessible OST emails to PDF. This program supports all version of Adobe Acrobat up to 9.1. OST into PDF converter program is compatible with all Windows OS (32 bit-64 bit). Tool recovers and export OST emails, contacts, task, journals from encrypted form. It can convert Outlook OST emails to PDF with all properties of emails and attachments. Software support all OST files whether created using Ms Exchange 5.0, 5.5, 2000, 2003, 2007 and 2010 to export OST to PDF document file format. Take a trial of demo version program that provides advisable and high-speed features to convert OST to PDF with exact previous format. But by using demo version licensed you cannot save OST emails into PDF file. If you would like to save several OST emails into PDF files with attachments and without any changing, then you have to purchase full version licensed of OST to PDF Emails conversion toolkit. "I am very impressed with your Flagship & Advisable OST to PDF Emails Conversion Tool that has convert my all OST emails into PDF files instantly in few instances."